I was not going to add this to the website at first. Then I discovered a couple of negatives sat on top of each other still in the print frame. The glass was cracked, the leather that joined the two lifting doors to the rear was rotten. Other than this it was in rather good condition. I am slowly gathering items to put together for when I start alternative printing processes. 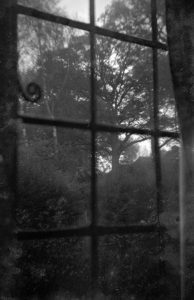 I thought this early 1900’s Kodak No. 1 Panoram Print Frame would come in handy. 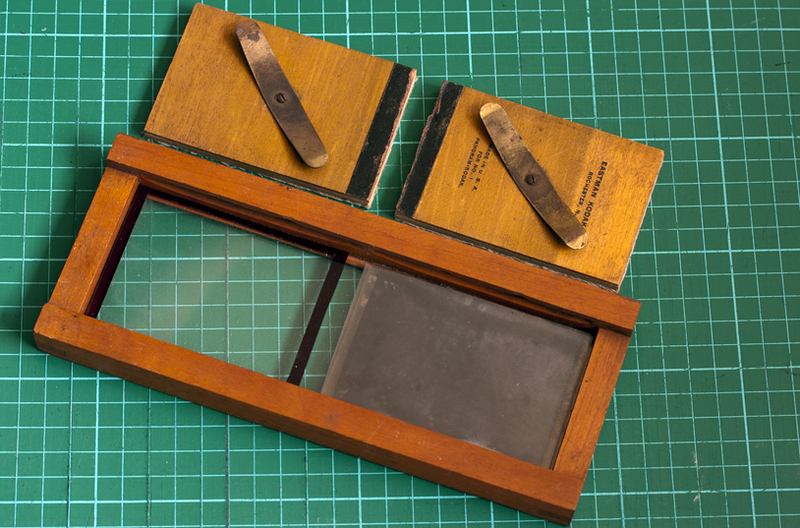 The print area is 65x190mm and was designed to take the negatives from the Kodak No. 1 Panoram Camera, which I might add is a very interesting camera. 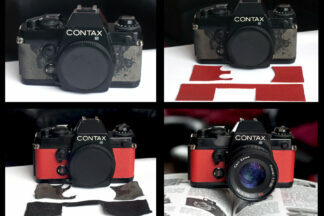 The No.1 camera took 112 degree images, 2 1/4×7 inches large on No. 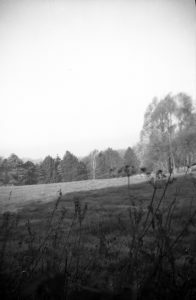 105 roll film. Unfortunately I don’t have this camera, although my beady eye is very much open to finding one. What I do have is a KMZ, (Krasnogorsk) FT2 Panoramic Camera. A.K.A Russian Tank Camera. 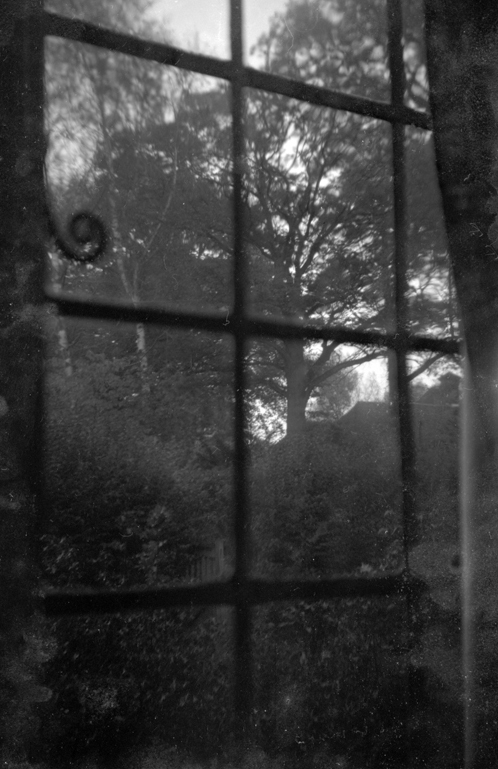 It takes 12 24x110mm exposures on a length 35mm film. 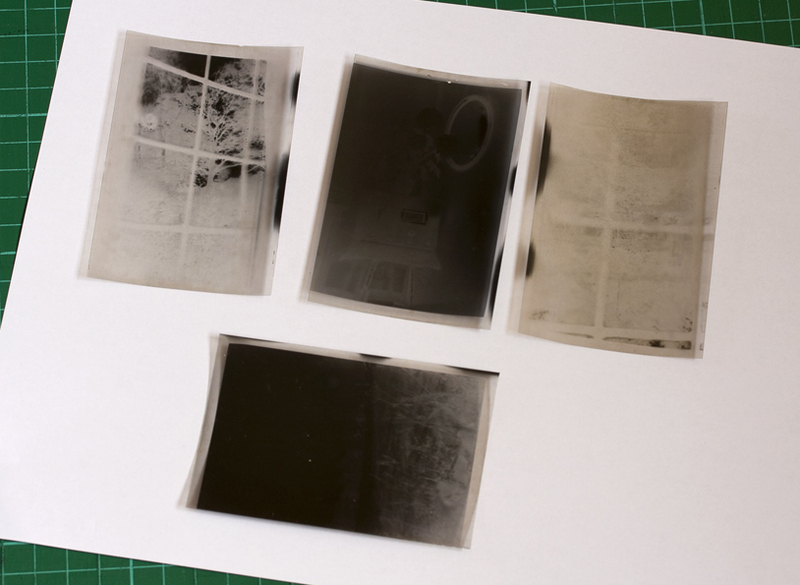 My idea is to use this print frame for these negatives and 6×9, (60x90mm) like the ones I found in the frame. 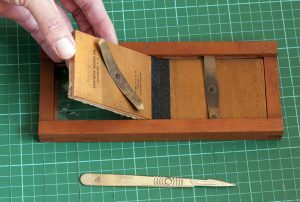 The repair was rather quick and simple. First off I cleaned off the old leather which was originally used as an hinge. 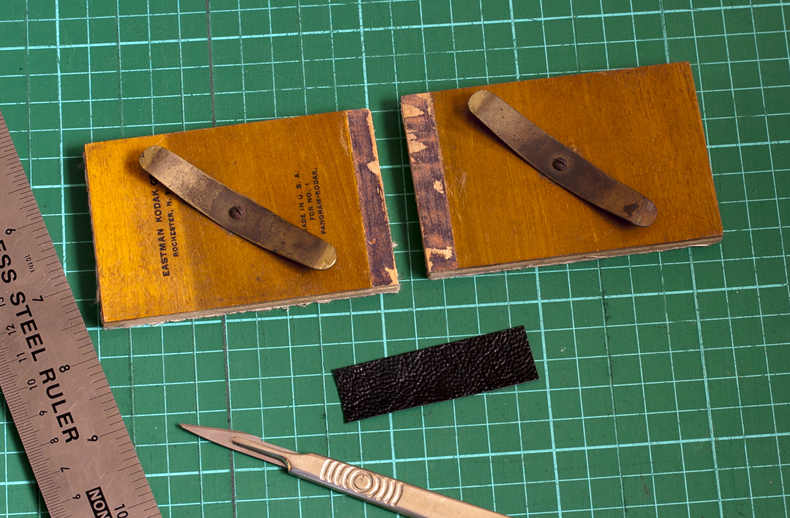 I then cut some new leather from my stock of camera leather, (available via my shop). I then attached the new leather and headed off to the glass shop for some 2mm picture framing glass. 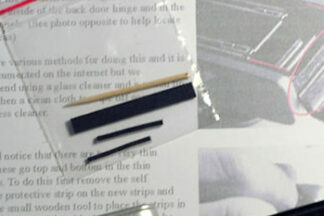 Be careful not to buy glass that has UV protection as it will take you weeks to expose your prints. The broken glass measured 2.7mm thick so I guess that greenhouse glass which is ever so slightly thicker at 3mm would be OK. Should I break the 2mm glass then I will try the green house glass. So what about the negatives I found? Well, I decided to scan them and while they were nothing special one I thought was kind of interesting. 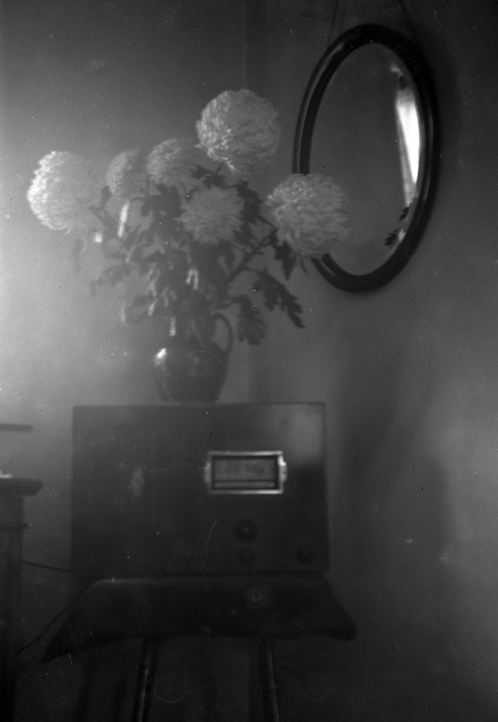 It was taken at a guess in the 1940-50’s and is of an old radio on a table with a vase of flowers on top. 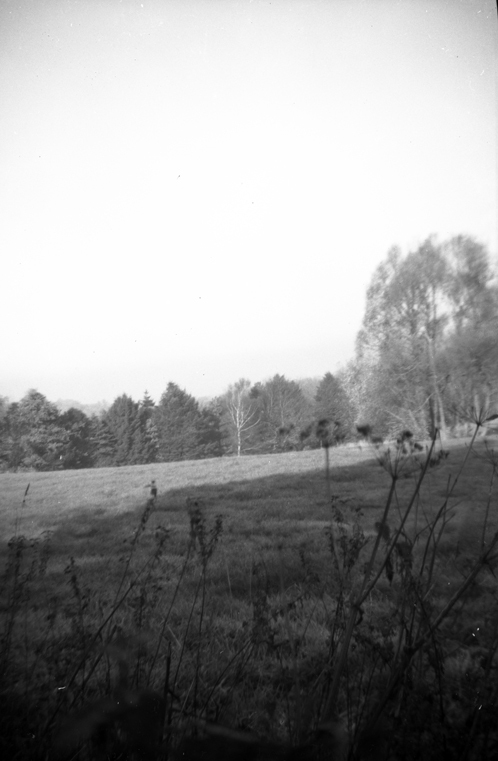 Unfortunately the negatives were either under or over exposed and rather tatty. Only three of the four scanned and are below for you to view. It would be nice to know of the real date, where they were taken, by whom or better still the camera used. Still its a nice find never the less.